I am Sylvia Martinez, and here is how Generation YES experiences might apply to OLPC. 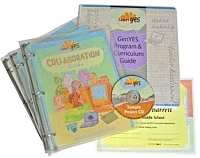 As a company, Generation YES started in 2001. But it's really the result of decades of work by Dr. Dennis Harper. 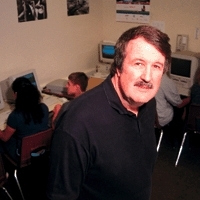 Dr. Harper brought computers to schools in dozens of countries around the world, teaching Logo and other uses of computers to students and teachers. He wrote the first textbook for teachers about computers in education. Along the way, he found that teaching students how to support teachers in their classroom was the most powerful way to introduce computer use in schools. Dennis became technology coordinator for the Olympia, Washington schools and immediately started to transform the district into a showcase of student-led, student-centered technology use. Back then he called the approach "Generation WHY." Not only did the students have access to technology in their classrooms, they sat on planning committees, pulled cable, taught teacher workshops, negotiated with vendors, and knocked on doors to get out the vote for technology bonds. There is more history on our website, but let's fast forward to today. Our curricular materials teach K-12 educators how to create and sustain a model of reverse mentoring for technology in their own schools. The model, now called GenYES, is simple but deep. Students learn about technology, develop planning and collaboration skills, and learn about how people learn. After this, each student partners with a teacher in the school. These student/teacher teams look at the teacher's curriculum and decide on a future lesson that could be enhanced with technology. The student then plans and creates the project, with the teacher providing the pedagogy and content. When the project is completed, the teacher has a lesson they can use in their classroom, understands technology better, and can directly observe the impact on students. A single teacher or staff member at the school facilitates all of this as the GenYES teacher. We have a decade's worth of research that shows that this model improves teachers' use of technology in the classroom more than any other kind of professional development. This partnership creates a collaborative learning community grounded in constructivist pedagogy. Both the student and the teacher are bringing important skills and knowledge to the relationship. Improving technology use in schools is an authentic problem worth solving. Working together creates mutual respect and understanding about each other's roles. Administrators and parents love to see students bloom and teachers finally teaching with new technology. Dr. Seymour Papert said, "The genius of this idea is that by contributing to solving a recognized problem facing schools, it rallies support from schools for something that goes against the grain of their traditional ways of thinking." The model works because it facilitates a constructivist atmosphere in the whole school, not by teaching teachers how to teach, but by giving students an authentic problem to solve and asking teachers to help. It builds on the pedagogical models developed by Dr. Papert and the years of research about what constructivist teachers do in classrooms. But we don't waste time drilling teachers about that - if you put the kids to work it happens naturally. It's what Dr. Papert calls, "kid power" in the OLPC plans. We encourage our lead teachers to get students working on projects as quickly as possible - give them time and space, and create an atmosphere that rewards risk taking. Most of the time teachers tell us that GenYES starts to work when they "get out of the way." Kid power is real. One of the roadblocks to our model in US schools is that there is not enough technology available for students, so teachers become gatekeepers. The OLPC solves that problem. There will simply be too much momentum to be stopped. Even if a few people oppose it, short of locking the computers in a closet, good things will happen with or without teachers. Learning will occur in the time the child spends outside of school. Parents and people in the community will benefit from access to the technology and the expertise of young people. Teachers will want to share that excitement. Traditional models of teaching technology to teachers and hoping that it trickles down to the classroom have failed for 30 years in the US. Let's not pretend that this flawed model of teacher professional development will suddenly work if we just find the magic formula of teacher workshop content. It won't work and it's not worth negotiating. Government and business leaders say and do a lot worse things to teachers than Dr. Negroponte who wants to create 21st century learning environments and has the guts, like Dr. Papert, to ask teachers to do better on behalf of children. The gifts and passions of kids are leveraged and accelerated by the OLPC. It will be successful because teachers like kids and are willing to work with them. In other words, I find it hard to believe that teachers will reject the power being provided to children because of insecurity or pettiness or some squabble with Dr. Negroponte. I took a look at the GenYes website and I was pretty impressed. Unfortunately, it appears that all of your content is proprietary. Is there any chance you will open-source a good chunk of it? Most developing countries won't be able to afford your materials in the short-run but they could immensely benefit in the long-run and so could GenYes. What's the cost of this program? Is there any independantly verifiable data bout this program, showing student academic achievement? Where has this program been implemented in the US? Why do you think this statement is true: "Traditional models of teaching technology to teachers and hoping that it trickles down to the classroom have failed for 30 years in the US" ? As far as I can tell, the US education system is working fine. It is NOT the best in the world, but it is not a failure, either. In fact, Mr. Negroponte has made a career off his association with MIT, a USA academic institution that is part of the "failed" American education system. Your post, in all sincerity, comes off as a rather shameless attempt at profitting from the OLPC project. and email has declined over the past three years. were more likely to be primarily focused on the creation of presentations (e.g. focused on Web page design than in previous years. Bryan - There is quite a bit of information on our website and research where people can learn a lot about the model for free. We just can't support it for free. We obviously don't own the idea of students helping out. People do this on their own - they call us and tell us that all the time. What we do is offer a way for schools to learn how to do this quickly and make it stick. Troy - I'm sorry it this comes off as a shameless plug. It wasn't intended that way. I didn't expect Wayan to go to all the trouble to add pictures to the post. It's nice and looks better than the plain text I wrote, but it does look more like an ad than I expected. But I don't want to make this worse by discussing prices, we have various levels and try to make it very affordable. It typically works out to less than $200 per teacher supported per school per year. I never said the US educational system is a failure, I said the way we do technology professional development has failed. This post is in direct response to the many calls for the OLPC to be implemented using a teacher-centric model. Troy #2 - the quotes you picked out of context are from a Northwest Regional Educational Labs report. They were later discussed in that report in light of the changing demographics of the sample over the years studied. The original schools involved were a self-selected sample who chose to participate. They tended to be more well off and concentrated in the states of Washington and Kansas. As more schools joined, they tended to be more spread out over the country and poorer because they had access to funding. Over the same time the demographics changed as well, looking more like the total US population. Powerpoint is there to prevent understanding and make the public stop thinking. Bottom line: OLPC cost per unit ~150USD. Add as much for the GenYES software. I am not personally against it (although the titles proposed are honestly not very encouraging). However, I want to see what was the impact of this software in all these years of operations. Did scores go up? Did SAT tests score higher? Did this help improving the conditions in US schools in depressed areas? Those are the real questions, that need to be addressed. Otherwise it's an inappropriate ad. I'm impressed you've spent so much time combing through the website to find snippets of things that you don't like, and a price list for a completely different set of products that I never mentioned. Often in US schools, PowerPoint is the ONLY piece of software that is widely available for teachers and students to use. That is an indictment of the purchasing decisions and Office-centric thinking by IT departments, not of kids and teachers. You also missed the part of the independent study by the NWREL that said that slideshow presentations are often the first attempt for teachers to use technology, and this changes in later years. As these studies tend only to be done in the first few years of implementation, it stands to reason that the projects reflect this. Again, this is not a "pitch" that this model be adopted along with OLPC implementations. The post is support for the OLPC intention to focus on "child power" as opposed to school gatekeepers. 1. I would argue that your model is successful because teachers love children and both are given the tools to discover how they can collaborate together and learn from each other. A process, or implementation plan, that took decades of work and the continuous personal involvement of Dr. Dennis Harper in its day to day management to succeed. Kudos to Dr. Harper (and you). Now let's hear the same message from OLPC. That they will spend as much time, energy, effort at the local level to install a similar model instead of Negroponte saying "forget the teachers and a plan, the kids will magically do it themselves." 2. I agree, one of the roadblocks to learning with technology is that there is not enough technology available for students, so teachers become gatekeepers. However OLPC will only solve that problem if a government is capable of spending Billions of dollars on technology. For some countries, like say, Nigeria the richest country in sub-Sahara Africa, it would still be 73% of their entire government's income to go one laptop per child. Yes, this would be Billions less than traditional computers, but its still too expensive for all but the richest. 3. Traditional models of teaching technology to teachers and hoping that it trickles down to the classroom have _not_ failed for 30 years in the US. I, and many of OLPC News readers, are a direct product of that imperfect yet functional teaching model. I learned on a TRS 80 in a classroom, an early school-based computer lab. Now I learned much more on my own afterwards, but I needed that initial familiarization to know how to operate the machine. Hopefully Sugar will remove that initial barrier, but still a child will need a teacher to understand algebra, informed debate, even skilled writing, no matter how intuitive or learn learned a child is through the XO. While a child can learn basic ideas through interaction with things, it takes human teachers (formal and informal) for full educational development. Would it be fair to conclude that, based on the information you have provided, your company does NOT have any data showing how use of your products has affected the academic achievement of participating students? Is there such data on your web site? Many of you seem to have missed the point in Sylvias article. GenYes do charge a fee to help implement their education strategy but they are a business. The real point to all this is empowering students as part of the education process. They become part of the process rather than as a result of the education process. I'd personally love to see a methodology implemented with the OLPC that allows students to help evolve their own education strategies. Why cant the kids help educate the teachers in the process? Great article Sylvia and I wish GenYes a great future in improving education and educators. Thanks Robert for getting this discussion back on track. I'd be happy to answer specific questions about GenYES in other places, but seems like we should focus on OLPC here. 1. Thanks for the kudos for the hard work. I'm at a loss to understand how you could look at the OLPC and not see the same effort and much more brainpower. I just don't hear, "forget the teachers". I hear "focus on the students". Different. Just because it's a big investment doesn't mean it's a bad investment. 3. I had a similar experience as you did. Lots of teachers back then brought computers into schools and figured out ways to introduce them to kids. I doubt your teacher taught from a lesson plan. Mine said something like, "look at this cool thing, let's figure it out." I hope lots of OLPC kids and teachers have exactly that opportunity. You might be shocked by the huge majority of "intro to computer" classes today that are little more than keyboarding, copying things in Word, and vocabulary tests. Yet they are all done with "well-planned curriculum." Despite the fact that the ratio of computers to students has increased so much in the past 20 years, there has been no corresponding increase in the use of computers in classrooms. I consider that a failure. A few bright spots created by exceptional teachers doesn't change the overall picture. 2. A big investment should have big validation. Government will be betting entire cohorts of kids and $$ millions at Negroponte's investment level. I would hope they would buy in with more than a "Trust me" or "Trust in the children"
3. I had a defined lesson plan based introduction, but I understand you point, however I disagree. I do not think technology = education. The Greeks did damn well with only Aristotle and bed sheets. Its takes a community to educate. Technology can be a nice tool, but is only one small part, which I think is the main difference in our approaches. And note I am no Luddite, but I do think that there is often too much emphasis or hope placed in computers. With OLPC all hope and emphasis is placed in one kind of computer. What has GenYes' use done for the academic achievement of participating students? How did it impact their official scores? Where are the "before" and "after" scores? As soon as I saw Dr. Harper's cheap toupee, I knew something was not kosher. 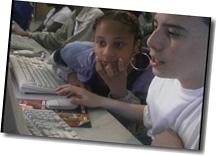 A cursory look at the "curriculum" (http://www.genyes.com/programs/genyes/units)confirmed my fears: this is just a bunch of people out to make a quick buck by hyping and misrepresenting technology's role in the classroom. Sorry to be so blunt, but I like to call it the way it is. Glad to see you focusing on what really matters in education - hairstyles and test scores. What can I say, Sylvia? Your scam operation is too much of a sad joke...but, in all honesty, I give yo credit for having the gusts to come here and pretend, with a straight face, that your "product" could enhance the OLPC project ("how Generation YES experiences might apply to OLPC"). Obviously there has been a shift in the public criticism of OLPC moving its center of gravity from initially hardware over software to nowadays mainly roll-out plan, pedagogy and learning content. This shift is natural since it is a reaction on the number of still unknown facts and associated uncertainties and misunderstandings at a certain point of time. When these facts are established and become known and understood the criticism is decreasing a lot and it gets more factual and less polemic. What are the differences about the hardware/software part of the OLPC development compared to the logistic and pedagogic part of the development? There were initially rel. clear specs for the hardware and - somewhat less clear - for the software. There was and is a core team, subcontractors and a community doing development. There were regular and detailed reports about the progress. The audience knew quite well what was already there and could more or less see what was planned next. The results can be measured and compared with the specs, the general status quo and other projects. The specs or project plan here are not so clear. There is a rather general and vague philosophy of constructivism not telling how it is really intended to be implemented using XO's. On logistics there is almost nothing published. There are no regular reports published on progress about content development. It is not clear who is working on it. Is OLPC staff involved or is it entirely done by national authorities? Is there a community involved? Will there be scores to measure educational achievements that can be compared to the status quo and other projects? There is not much information published on those questions. It is no surprise that this unclarity leads to speculations and misunderstandings. Why is this part of the project so much undocumented? Is it because the OLPC leadership does not want to tell about their plans? Why? Or even worse: Don't they have detailed plans yet themselves? Why not start a small core project team which again starts an open source community working publically on it? This model worked quite well for hard/software. This way some principles of constructivism and genYes could still be implemented in free and open-source contents and curricula. Such a community project could serve as a basis for local language translation and local content adjustments. Many governments would probably take over a good part of it in order to save time and effort. Local teachers could participate and increase local acceptance among their peers and the public. If OLPC is not going to take action or to tell soon about their plans - if there are any - then maybe an independent community has to form to do this. The content could be designed to work with XO's as well as Classmates and other platforms. The content could be adopted freely by all schools in the first, second and third world. Education results and experiences could be exchanged. No matter where, education is too important to leave it to governmental administrations or the OLPC leadership alone. I'll take that as a strange compliment. I appreciate Wayan's invitation to post a guest article and have valued the constructive comments and responses. Again, I never made any claim about "enhancing" OLPC or tried to sell anyone anything. Since the OLPC is at such a preliminary stage, I think skepticism is wise and warranted. That's why I read OLPC News. It's just smart to look at existing programs and practices (like GenYES) that might be relevant to make better educated guesses about the future. I think this was a very interesting article with some very good ideas. There are always students in a class that can work with computers better than teachers, and it makes sense to engage those students to improve technology integration. troy, I don't think it's fair to ask about test scores. 1. Why would you assume students' increased computer competency affect test scores in other subjects? If the computers don't teach algebra, you can't expect higher algebra scores, can you? Even if there were standardized tests for computer literacy, I doubt they would measure some important things, e.g. the ability of a student to use a new program never before encountered. 2. By having students help prepare educational material, you are teaching them to teach and to collaborate; these skills are valuable but not detected by exams. Think about how many geeks there are (myself included) who got high test scores but never learned social skills or collaboration skills in school. Students may learn to answer multiple-choice questions, yet have no idea how to explain what they know to another human being. In summary: test scores aren't everything. 3. Many factors affect test scores. Even if the program did tend improve test scores, and even if this was reflected in measured data, a critic would rightly point out that the increase could be attributable to any number of factors.